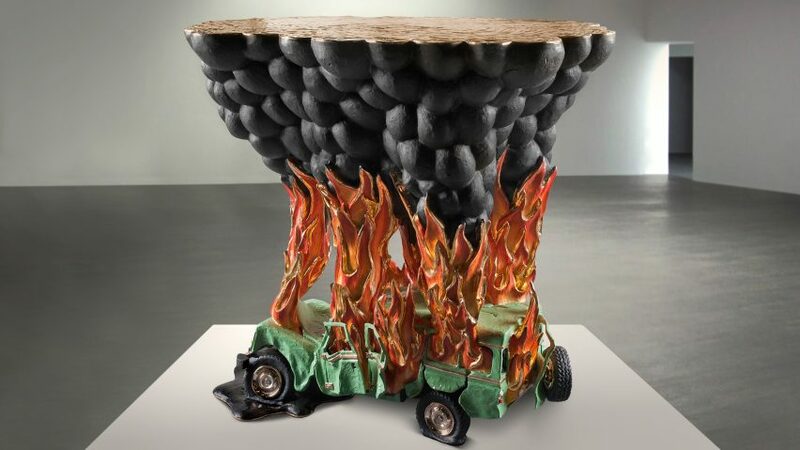 Studio Job has expanded on its autobiographical Train Crash table with a coffee table version depicting a burning car. The Car Crash coffee table was presented by New York's Chamber gallery during this year's Design Miami. It is described by the studio as an "explicit reaction" to "explicit times" – a prominent theme across many of the works also on show at the fair. "Every time we try to be normal and minimal but somehow we never succeed," the studio told Dezeen. "Explicit times provoke explicit reactions." The table depicts a green car that has been involved in a collision, and as a result is smashed up and on fire. Black smoke billowing from the crash rises up from the flames and spreads out to form the table top. The piece is made from a polished bronze casting, and each detail has been hand painted and gilded. Studio Job, led by designers Job Smeets and Nynke Tynagel, is known for its fantastical and often autobiographical pieces. A former couple, Tynagel and Smeets' previously designed a Train Crash table that symbolised their romantic break-up as a head-on collision. During Design Miami, which took place from 30 November to 4 December 2016, the pair also unveiled an eight-metre-tall tree depicting an array of memories and thoughts outside the OMA-designed Faena Forum building.